Twitter is a Social networking and microblogging service utilising instant messaging, SMS or a web interface. Last year october , Twitter updated its advertising tools on Monday, enabling marketers to schedule and publish tweets directly from Twitter. 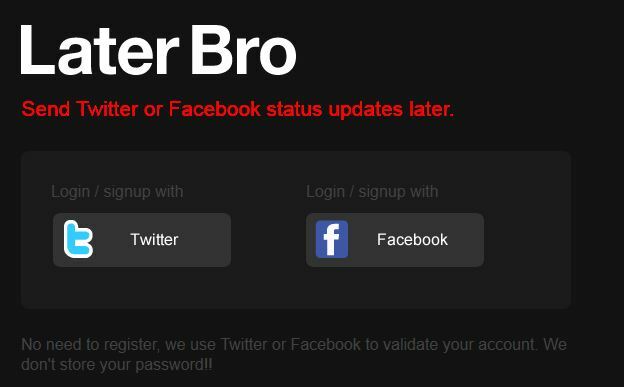 Many third-party applications have therefore been developed to make Twitter easier to use and abilities is to schedule Twitter updates. Hootsuite allows you to schedule and publish updates across multiple social network like Twitter, HootSuite also allows you to add RSS feeds to your account to update your social networks when new posts are available from your own blog as well as others. HootSuite also monitor keywords, manage multiple Twitter Accounts, Facebook and also schedule tweets for later. With Twuffer you can compose a list of future tweets and schedule their release via a simple calendar-based interface. Once you’ve signed in and authorized the service, you will be able to view a list of scheduled and sent tweets. It is also great tool for bloggers to use. FutureTweets is a free service that lets you schedule your Twitter messages. Send it at a specific time in future or re-send Tweet daily, weekly, monthly or yearly!. FutureTweets is very simple. You just need to Sign in, set your timezone, write your tweet, set the time and date you want it to be updated on Twitters and click “Schedule.” it also allows you to fadd emoticons and “flip” your tweet, so the text appears upside down. It is a great tool to try. Buffer is a no-nonsense web application that lets you designate fixed times for your tweets to go off. I love this app because , It allows you to set up a specific scheduling pattern. Update that is set up with Buffer will be set out at the next available time slot. 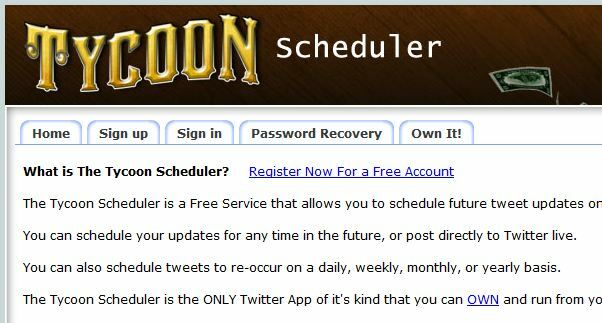 Tycoon Scheduler allows you schedule your updates for any time in the future, or post directly to Twitter live. It is a great tool to try. 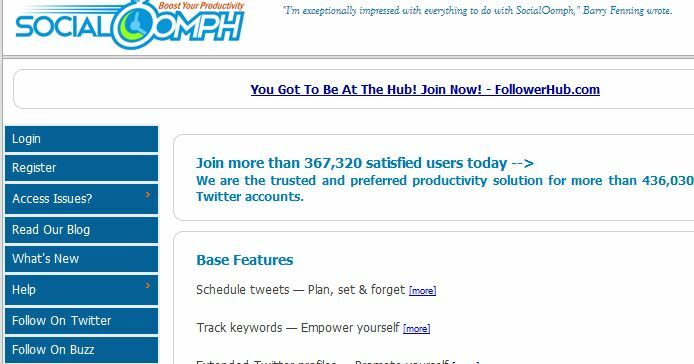 Socialoomph is a free social networking tool that allows you to save tweets that you might want to schedule again and again. It Boost your social media productivity it doesn’t have to be a manual time-consuming process!. Easily schedule updates, find quality people to follow, and monitor social media activity! 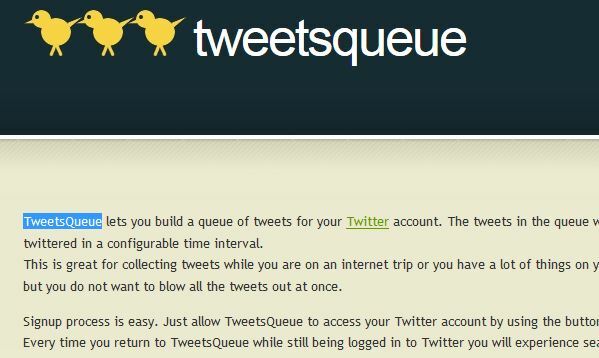 TweetsQueue lets you build a queue of tweets for your Twitter account. The tools also allows to set in a configurable time interval. it also help you to Schedule Tweets For Later. You can schedule recurring twitter updates or schedule tweets from multiple Twitter accounts!. Gremln also known as (Twaitter) provides users with “Best-In-Class” scheduling tools to help you time your social media strategies to the minute with Gremln’s finely calibrated scheduling system.. In the comments below, let us know if you are using any of these tools, What are your experiences with the tools? Do you have any others and if you be pre-writing future tweets, and why. With these tools, anyone can schedule tweets up to a year in advance on any date and time that they choose. It went very awesome from the time Twitter announced that advertisers now have the ability to schedule tweets. To wrap it up, thanks for the share. This is quite a lot. More power and have a great day! Feel free to share it with your love ones. Thanks a lot for the Contribution.